Welcome to Casa de Helene, THE 1,850 sq^2 BEACHFRONT OCEANFRONT PENTHOUSE SUITE on the 22nd floor of Building III of Playa Azul on the world famous Luquillo Beach in Luquillo Puerto Rico. This Penthouse condominium is one of the largest & finest in all of no-passport-needed Puerto Rico. It has 3 bedrooms & 3 full bathrooms including 2 master bedrooms w/full bathrooms & walk-in closets, & a 3rd bedroom & adjoining 3rd full bathroom. It also has a 30 ft. balcony with a spectacular panoramic, breathtaking view of the ocean & surrounding beaches. It is reasonably priced for up to 6 persons of a family, couples, or singles. A cot is available for a 7th guest as well as a crib/playpen for a child. Before booking elsewhere, please note there are NO other charges such as NO CLEANING FEE that others charge that may add hundreds of dollars to your cost. Please see this web link Washington Post story about the Puerto Rico recovery that has made great progress. https://www.washingtonpost.com/lifestyle/travel/puerto-rico-puts-hurricane-maria--and-the-bulk-of-the-recovery--behind-it/2018/12/06/dff10a40-f25c-11e8-aeea-b85fd44449f5_story.html?utm_term=.725e608ffd87 The building suffered Maria hurricane damage undergoing continuing repairs, but is fully functional, and the condominium shows no sign of damage after replacing the balcony tile and has been repainted and spruced up. The Penthouse has year-round weather in the 70's & 80's. It has a golden, sandy beach with warm 80+ degree clear & clean water with coral reefs & tropical fish. Swim, surf, & sunbathe. You also have a tropical mountain rainforest above the beach with cool wading waterfalls surrounded by orchids. If you want lots of space, & are tired of small, cramped, beach condos, this is your dream vacation home! The condominium has FREE 10-BIT HIGH-SPEED DIGITAL CABLE INTERNET/E-MAIL access including optional WIRELESS connectivity. It also has FREE LONG-DISTANCE TELEPHONE calling to ANYWHERE IN PUERTO RICO and ANYWHERE IN THE CONTINENTAL UNITED STATES. It also has four televisions including a 46' LCD Sony Full HD 1080P with BlueRay HD DVD player. You get it all with this fabulous vacation rental! Yes, the Penthouse is right on the beach! Everything you want is here - Sun, sea, & sand - Endless Beaches - Pristine waters with coral reefs. Swim with the Angel fish. Experience a tropical mountain rainforest that majestically rises above the Penthouse. Rest, relaxation, & recreation all at your immediate beckoning. The Penthouse has imported Italian tile floors, & large, open living areas. It is a guarded/gated community. This condominium complex also has a tennis/handball practice wall, basketball courts, & more. This condominium is located between the Wyndham Rio Mar, Wyndham El Conquistador, & the Gran Milia Resorts & Casinos. They are visible & easily accessible from the condominium for restaurants, casinos, & nightlife. They also have championship 18-hole golf courses. You may enjoy these amenities sans the $500+ per night price for a 400 sq^2 room that is not even waterfront. The tropical mountain El Yunque Rainforest is a 15-minute drive. The El Faro Lighthouse Museum & adjacent Las Cabezas Nature Reserve (bioluminescent mangrove lagoon) & wooden above ground nature walk are within 15 minutes. The historic walled fortress city of Old San Juan is a 45-minute drive. The port town of Fajardo & boat hires for sailing/boating, snorkeling/SCUBA, Blue Marlin fishing, & the ferries to Culebra & Vieques Islands, is a 15-minute drive. All the crowded boating/diving excursions of the San Juan resorts come to this part of the island as it is has the best coral reefs, water clarity, & water conditions. This is the beginning of the Caribbean side of the island. There is horseback riding on the beach, & horse racing nearby. There are also great nearby shopping & restaurants. Everything you want in a tropical vacation is here! The 2 master bedrooms are located at each end of the condominium for privacy, & each has a full private bath. One master bedroom has a king-size bed, & the other master bedroom has a queen-size bed. Each master bedroom also has a dresser(s), sofa, tables & chairs, & a walk-in closet. Each bedroom also has FREE digital cable TV. The 3r d bedroom also serves as a media center office combination. The condominium has FREE 10-BIT HIGH-SPEED DIGITAL CABLE INTERNET E-MAIL CONNECTION with WIRELESS option and cable TV/VCR. It also has FREE LONG-DISTANCE TELEPHONE calling to ANYWHERE IN PUERTO RICO and ANYWHERE IN THE CONTINENTAL UNITED STATES. The 3rd bedroom has 2 twin beds that make into a king bed if desired, & is across the hallway from the 3rd full bathroom. The condominium is particularly ideal for families, couples, & responsible single adults. This Penthouse condominium has a 30 ft. balcony overlooking the ocean & beaches. The balcony is so spacious that it has a sofa & matching chairs that seat 6 people, tables & lamps, & a 4 person breakfast table & chairs. You only get this size balcony with this condominium PENTHOUSE SUITE. The balcony faces west over the beaches & ocean, & the sunsets are incredible! This condominium has a fully equipped, modern kitchen with glass-top stove, oven, & microwave. The kitchen has a side-by-side refrigerator/freezer with in-door icemaker & water dispenser. It has twin sinks with garbage disposal & dishwasher. There is a washer & dryer combination. The Penthouse has 2 adjoining, open living rooms that seat 10 people, & a 6 chair dining room. The 3 bedrooms are air conditioned, but not usually needed with the Trade Wind breeze, & ceiling fans in every room. Air temperature is cooler in the summer at the condominium than in the States, & no vacation rainouts! Being up 22 floors, you shall NOT experience ANY flying insects such as flies, misquotes, wasps, hornets, nats, ticks, etc., etc. Penthouse rentals usually for 1 week or longer. Inquire on rental requests of less than 1 week. No Sub-Letting allowed. Pets by prior approval. Smoking on the balcony only. We are sister & brother; Joanne from Connecticut and Richard from the metropolitan Washington DC area. This condominium was our mother's and father's (US Army Col.) retirement home. We keep their home, now our home, in as fine a condition as would they, and perhaps better as they would not spend the money as we have on expensive amenities such as four TV’s one of which is a large-screen HD LCD Sony. Pic is of Richard's spouse Nancy at their waterfront farm in SOMD. As our mother's and father's (US Army Col.) retirement home, which we were fortunate to inherit, in their memory, we maintain it according to their high standards of excellence. Our home is one of the finest & most spacious condominiums on one of the best beaches in the Caribbean, & is nearby the El Yunque Rainforest and the fantastic bio bay. It is one of only a few 3 bedroom 3 bathroom penthouse suites in all Puerto Rico. The condominium aLso has FREE 10-BIT HIGH-SPEED DIGITAL CABLE INTERNET/E-MAIL access including optional WIRELESS connectivity. It also has FREE LONG-DISTANCE TELEPHONE calling to ANYWHERE IN PUERTO RICO and ANYWHERE IN THE CONTINENTAL UNITED STATES. It also has four televisions including a 46' LCD Sony Full HD 1080P with BlueRay HD DVD player. Great apartment, great place to visit! Could not have asked for a more perfect place for our family get together. This house truly feels like a family home- well loved and full of EVERYTHING you would need for your vacation. Chairs, beach towels, coolers, a kitchen full of all the equipment for meals. Richard is an amazing communicator. This apartment has views of the ocean, as well as the rainforest. Centrally located near restaurants and groceries, but the far greatest feature is the beach with the most perfect waves in the world. Come enjoy this amazing opportunity at Casa de Helene. As a family of 6 including 2 children under the age of 6...we were comfotable in every room. The sea wind was always available and controlable with window louvers . The views were gorgeous. Equipment for beach needs was available in it’s own closet. Everything works. Although the community pool is currently under renovation as is the playground. The building is still being repaired after Maria.The beaches moments from the building are exquisite. Great restaurants within walking distance downn the beach. We all had a spectacular vacation here. Our family of five, including two teens, stayed here Christmas week. The location is amazing. About 45 minutes from Old San Juan, 15 minutes from El Yunque Rainforest and 30 from Fajardo Luminescence Bay. We walked the beach but didn't swim since the rio currents were too strong at this time and honestly, we were too busy. THe condo has everything you need and the views on bother sides are amazing. The ocean sounds were so loud and the owner is correct, the A/C really isn't run much due to the wonderful cross breezes. The condo is a little dated in furnishings, but they are all well maintained and comfortable. The owner sent a large packet prior to us leaving and has excellent communication. There is a Walgreens and grocery store within walking distance. 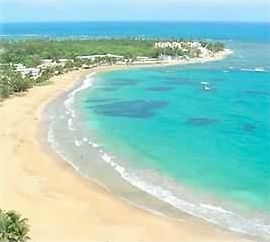 Glad we chose to stay in the Luquillo area since there is so much to do near here and a day trip to Old San Juan is easy. The owner recommended sailing with Erin go Braugh and wow was this amazing. There are a ton of restaurants 5 minutes down the road and too many to choose from, La Papilla and Revolution Pizza were great. Would definitely stay here again. Absolutely gorgeous views, wonderful property. Plenty of space and definitely a home away from home! Can't wait to book again. Luxury is the last word we would use for this condo. The furniture, bed linens, towels are at least 30yrs old. All living room and dining room furniture may be new fabric, but needs badly to be replaced, no where to sit that is not painful. 2 bedrooms the beds are fine, the queen was composed of 4 layers of foam placed on top of each other. We had to have plywood made and placed to have someone use bed. I bought new sheets and cotton blankets for beds, and towels are old and stained. The master bedroom is old, tired, beat up white wicker furniture. We were there for a month- very expensive for condition of apt. Penthouse indicates security key for elevator, did not exist. The living space is all glass topped furniture, be careful with children. These very elderly reviewers, well beyond my 69 years & my wife’s 70, needed continual & excessive assistance from my manager to handle normal home operations, who made several trips to assist them in simple matters such as turning on the TV’s. These reviewers appear to need accommodations more suited to assisted-living. This review is not consistent with other reviews, which affirm this as a luxury condominium w/the finest amenities. As the continuing owner of my mother’s retirement home, I spend extensive condominium income to continually update & refresh it. It appears these guests wanted living room furniture far taller than normal. The 2 living rooms have 3 heavy-duty wicker sofas in appropriate Caribbean decor & all have new, expensive richly appointed upholstery. The dining room & 2 living rooms have thick glass-top tables w/safe rounded edges. 1 of the 2 living rooms has a very new & expensive work-of-art hand-carved teak wood living room glass top coffee table. The queen bed the guests did not like is a new Sears Sealy Posturepedic Adjustable Bed where the head & foot raise up & down. The mattress must bend to adjust, but is of the finest flexible materials. My manger purchased boards to put under the mattress to make it extremely firm for them, but the bed no longer adjusted, and he removed the boards after they left. My wife & I sleep on this bed when there as it is new, firm, but adjustable & the most conformable of all the beds. We have multiple sets of bedding & towels for each of the 3 bedrooms, which I regularly rotate & replace. The bedding & towels are clean & fine. The kitchen is up to date w/large side-by-side refrigerator/freezer w/in-door ice dispenser, glass top stove w/oven, built-in microwave, dishwasher, garbage disposal, toaster oven & coffee maker. There is a new stackable clothes washer & dryer. Over the past 2 years, I replaced all the outer windows in the 3 bedrooms, the front door & all the folding inner doors. 2 of the 4 TVs are new. We replaced all the air conditioners & blinds in the 3 bedrooms & celling fans in 2 bedrooms. The dining room has a new real crystal chandelier. 3 of the 4 beds are new. All this cost some $25,000+ & the list goes on including boogie boards, beach coolers, beach chairs & towels, beach toys, tennis rackets & balls, pool sticks & balls, basketballs, footballs, soccer balls, Frisbees, etc. When asked about their stay, despite their contrariness, they indicted they had a great time. Go-figure. The first payment of 25%. The second payment is the full balance amount of the rental 30 days in advance of travel. Extra Christmas & New Years nights beyond 7 are available.